Preheat oven to 180°C. Line a baking tray with non-stick baking paper. Place the sweet potato and onion on tray. Lightly spray with olive oil spray. Bake in oven for 20-25 minutes or until tender. Meanwhile, combine the ground coriander, cumin and oil in a bowl. Add the lamb and turn to coat. Heat a frying pan over high heat. Cook the lamb for 2minutes each side or until brown. Transfer to a baking tray. Bake in oven for 3-4 minutes for medium or until cooked to your liking. Transfer to a plate and cover with foil. Set aside for 5 minutes to rest. Thickly slice the lamb across the grain. Combine the yoghurt, fresh coriander and lemon juice in a bowl. 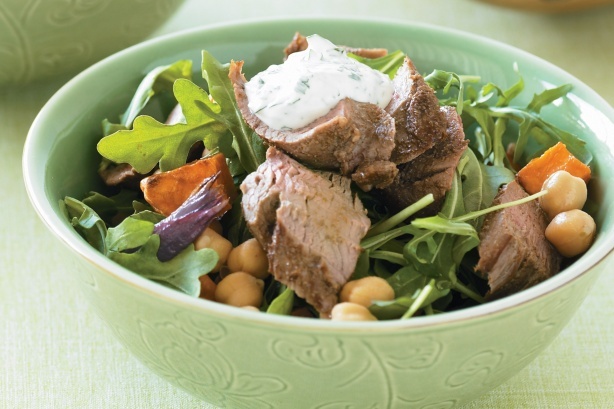 Combine the sweet potato, onion, chickpeas, rocket and lamb in a bowl. Divide among serving bowls. Top with dressing to serve. 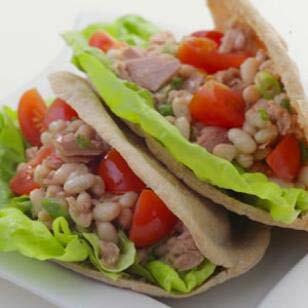 Combine tuna, beans, tomatoes, scallions, oil, lemon juice, salt and pepper in a medium bowl. Stir gently. Refrigerate until ready to serve. Ingredient Note: When you use canned beans in a recipe, be sure to rinse them first in a colander under cold running water, as their canning liquid often contains a fair amount of sodium. Whisk together the olive oil, lemon juice, and honey. Add 1/2 teaspoon salt and 1/8 teaspoon pepper; set aside. Heat a grill pan to high. Lightly coat chicken with olive oil spray, and season with remaining salt and pepper; cook over high heat 2 minutes per side or until just cooked through. Transfer to a cutting board; let stand 5 minutes. In a serving bowl, toss tomatoes, cucumber, feta, olives, and vinaigrette. 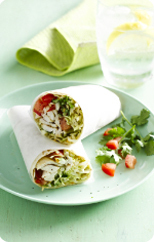 Slice chicken into 1/2-inch strips, add to salad, and toss gently. Lay the lavash bread on a board. Lay the shredded lettuce over the top, leaving a margin of about 4cm along one long side. Top with the drained tomato slices and chicken, finishing with the sauce. Make a fold in the bread along the margin (to hold the filling at the bottom of the wrap), then roll from one of the short sides to enclose the filling. Wrap firmly in paper then cling film. Cook spaghetti as packet directions in unsalted water. Drain. Meanwhile, heat oil in a deep frying pan and cook onion and garlic until softened. Add marinara mix and cook over high heat until seafood is just cooked through, about 4 minutes. Pour in evaporated milk, add herbs and lemon rind. Season with pepper. Bring to boil. Add the drained pasta to the sauce and toss to coat. Heat a saucepan over medium heat. Stir the quinoa for 2-3 minutes or until aromatic. Stir in water. Bring to the boil. Reduce heat to low. Cover. Simmer for 15 minutes or until the water is absorbed. Cool for 10 minutes. Transfer quinoa to a large bowl and place, uncovered, in the fridge until required. Meanwhile, chop half the mint. Combine the chopped mint with the yoghurt in a small bowl. Season. Place in the fridge until required. Cut slits in the skin of each salmon fillet. Transfer to a plate. Drizzle over 2 teaspoons oil. Season. Preheat a barbecue flat plate or frying pan on medium-high. Cook salmon, skin-side down, for 3 minutes. Turn and cook for 1-2 minutes for medium or until cooked to your liking. Transfer to a plate to rest. 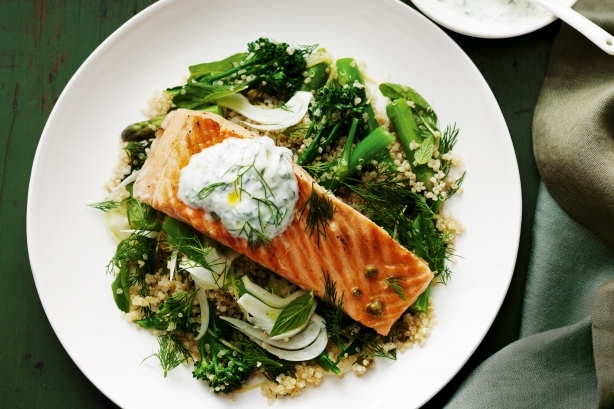 Add broccolini, asparagus, sliced fennel, fennel fronds, dill, capers, cumin, lemon rind and juice, and remaining mint and oil to the quinoa. Season. Gently toss to combine. 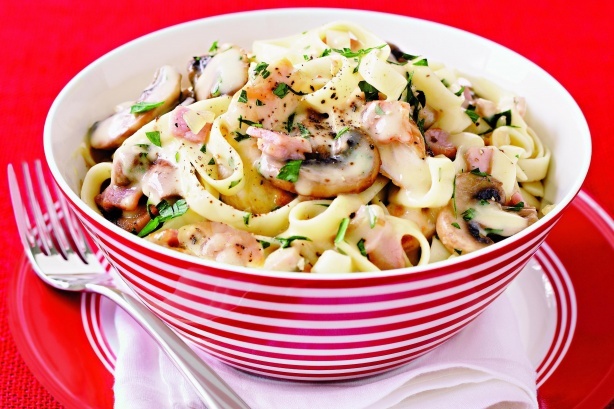 Serve with the salmon and yoghurt mixture. Cook pasta in a large saucepan of boiling, salted water, following packet directions, until tender. Drain pasta, reserving 2 tablespoons cooking water. Return pasta and water to the saucepan. Heat 2 teaspoons of oil in a large, non-stick frying pan over medium-high heat. Add half the chicken. Cook for 4 minutes on each side or until golden. Remove to a plate. Cover to keep warm. Repeat with remaining chicken, adding more oil if necessary. Cut chicken tenderloins diagonally into 3 pieces. Preheat oven to 220C/200C fan-forced. Place pumpkin, oil and seasoning in a bowl. Toss to coat. Transfer to a baking tray lined with baking paper. Roast for 20 to 25 minutes, turning once, or until golden and tender. Meanwhile, place quinoa and 1 1/2 cups cold water in a saucepan over high heat. Cover. Bring to the boil. Reduce heat to low. 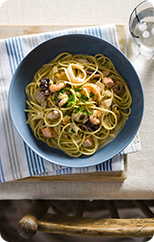 Simmer for 10 to 12 minutes or until liquid is absorbed. Place quinoa in a heatproof bowl. Add pumpkin, lemon juice, preserved lemon and coriander. Season with salt and pepper. Toss gently to combine. Serve. Place the fish, garlic, oil, cumin, paprika and cayenne pepper in a large bowl and toss to combine. Season with pepper. Place a large non-stick frying pan over medium-high heat. Add half the fish and cook, turning occasionally, for 4-5 minutes or until just cooked through. Transfer to a plate and cover with foil to keep warm. Repeat with the remaining fish. Add the onion and celery to the pan, and cook, stirring, for 2-3 minutes or until the onion softens slightly. Add the pumpkin and zucchini and cook, stirring, for 1-2 minutes or until tender. Meanwhile, place the couscous in a large heatproof bowl and pour over the boiling water. Cover and set aside for 5 minutes or until all the liquid is absorbed. Use a fork to separate the grains. Add the fish, pumpkin mixture and coriander to the couscous and gently toss until well combined. 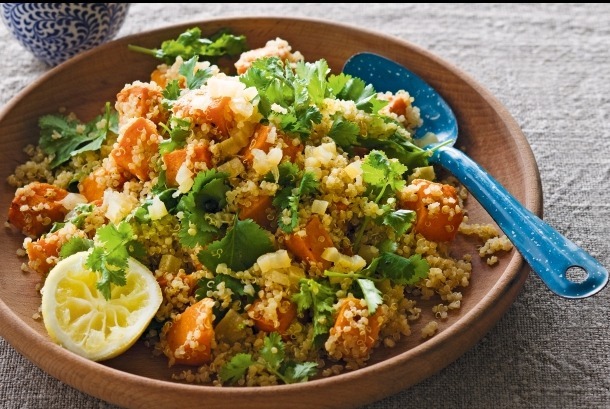 Divide the couscous mixture among serving bowls and top with a dollop of yoghurt to serve. Toast or chargrill bread. Combine remaining ingredients in a small bowl. Let stand for 10 minutes. 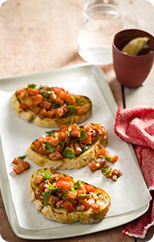 Cut the bread slices in half and spoon over tomato mixture.